Heckler & Koch have recently sent out a press release announcing their new striker fired subcompact pistol, the VP9SK. This new handgun is announced coinciding with the 2017 NRA Annual Meeting in Atlanta, Georgia. According to H&K the handgun is already available for sale and you won't have to wait for shipping straight from Germany, as a major shipment is already sitting in wait at H&K's Columbus, GA facility. The following is H&K's press release about their big news! With a retail price of $719, the VP9SK continues HK's trend of affordability in a superior quality handgun. 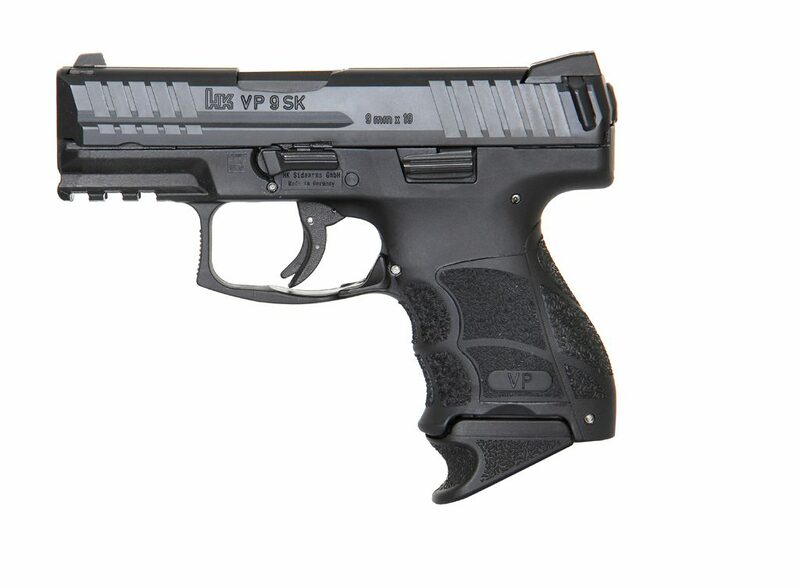 The VP9SK is made in Germany and carries HK's Lifetime Warranty. A small-scale version of the completely adjustable VP grip feature -consisting of interchangeable backstraps and lateral grip panels -is present in the compact grip frame of the VP9SK. This allows the pistol to be easily modified to fit any individual user and is a feature found only on Heckler & Koch handguns. Molded finger grooves in the front of the pistol's grip also instinctively position an operator's hand for optimal shooting. HK's patented charging supports, introduced on full-size VP pistols, are also present on the VP9SK. The charging supports are simple, polymer inserts that are mounted on each side of the rear of the slide and provide better gripping leverage for racking the slide rearward. The charging supports speed reloading and makes operating VP series handguns easier for shooters with reduced hand strength. VP9SK pistols have an abbreviated Picatinny MIL-STD-1913 rail molded into their polymer frame for mounting lights and accessories. A proprietary captive flat recoil spring helps VP9SK pistols reduce the recoil forces affecting the operator and the handgun, improving shooter control during rapid firing and prolonging component lifespan. VP9SK pistols can use a variety of proven HK magazines, including compact double stack 10-rounders with flat or hooked, ergonomic floorplates. New 13-round and 15-round magazines with magazine sleeves that replicate the grip profile of the full-size VP will also be available later in the year. So what do you all think of this new piece of German tech? Are you excited for H&K's announcement? Let us know in the comments below.